Can't recommend this place more. It was great. 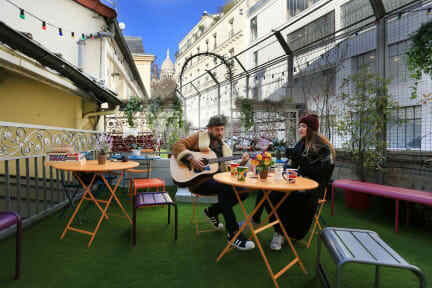 wasn't located on a busy street, famprix right next door, a pharmacy close by, great and helpful staff, nice rooms, comfortable bed, secure lockers, and all beneath the beautiful sacre coeur. What more can you ask for?? The staff was incredibly helpful and they were constantly there to help or answer questions at all hours. Thanks! I had a great time, the dorms were great. The staff were excellent, hats off to Roman who was an awesome host. Hostel location was great - right in the Montematre area, plenty of restaurants and supermarkets nearby and very close to a metro stop or walking distance to Gare du Nord. 4 person dorm room was small but adequate with a small locker for your valuables. Kitchen was kept clean and there was free tea. Maybe not the place to meet people but the terrace was nice. Really helpful staff and great friendly atmosphere. The kitchen facilities were very good. My only complaint is with the shower being tiny and having very poor water pressure/not much water. And with the room being cold. There was an electric heather in a corner of my room but it didn't distribute heat accross the whole space very well. There was no indication from staff that it was up to me to turn on the heater, and my first night I was freezing. Close to Anvers station and very friendly staff. Only criticism is the quality of the mattress which sunk down when I slept and the bed squeaked a lot. The hostel is very well located. I was disappointed in the lack of social vibe as I am travelling solo, not an issue if you are traveling with friends. Rooms were nice enough and nice to have an ensuite bathroom in a shared room. Terrible experience. I was overcharged on my booking, facilities were under construction, all my stuff was removed from my bed and my bed was completely re-made during my stay because of confusion with another guest checking in (offered no apology). I ended up checking out two nights early. I will not be back.